The man who wrote Square-Enix classics Final Fantasy VII and Chrono Trigger thinks that Nintendo's handheld dominance is finally at an end, thanks to a certain company named after a fruit. In 1989, Nintendo launched the Game Boy. This unassuming gray brick would herald two decades of the Big N's absolute dominance in the handheld arena. Countless challengers sought to usurp the handheld throne from Nintendo - the Sega Game Gear, the NeoGeo Pocket, and the N-Gage, to name a few - and while Sony's PSP has held its own and not knuckled under like the rest, the House of Mario firmly remains the handheld king. And yet, just a few weeks away from Nintendo's formal unveiling of its next handheld generation, the man behind some of the most beloved JRPGs of all time thinks that its era of control has reached its twilight. Masato Kato, who wrote Final Fantasy VII, Chrono Trigger and Xenogears (among others) said that the age of Nintendo was over - and that the entity that had cast Nintendo from its hill of money was not rival Sony, but newcomer Apple. "With the iPad going on sale, the epoch of Nintendo is finished," Kato said via Twitter, translated by Kotaku. 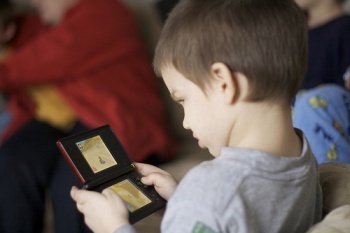 "But with the DS and the Wii, it's been digging its own grave." It's true that Nintendo's boss-man Satoru Iwata has called Apple the "enemy of the future," indicating that the hardware giant is aware of the threat imposed by the House of Jobs and the popularity of its iPhone, iPad and iPod platforms. So, in that regard, Kato is absolutely correct that Apple is a danger to the Big N.
But I have to take a bit of umbrage with the second half of that statement. Hey Mr. Kato, have you seen how well Nintendo's hardware has been selling this generation? It's not so much digging its own grave as it is lining its own bed - with hundred-dollar bills.